The British rockers Muse are to screen their new concert film "Drones World Tour" on July 12 in theaters around the world. The 90-minute "Drones World Tour" was filmed and directed by Tom Kirk and Jan Willem Schram. It captures Muse performing in multiple cities in 2016, playing a career-spanning set including "Psycho", "Madness", "Uprising", “Supermassive Black Hole", and more. The film contains never-before-seen special effects with autonomous drones flying over the audience creating giant projections and intricate LED lasers for an incredible audio and visual experience. The band’s frontman Matt Bellamy said, "The symbiosis between humanity and technology has always been something I am interested by. Drones just seem to be a very interesting modern metaphor for what that represents... You want to leave people with the idea that they ask the question themselves about the role of technology in our lives and whether it's a good thing or a bad thing." Tickets for the one-day showing are already on sale. Click here for ticket and theater information. 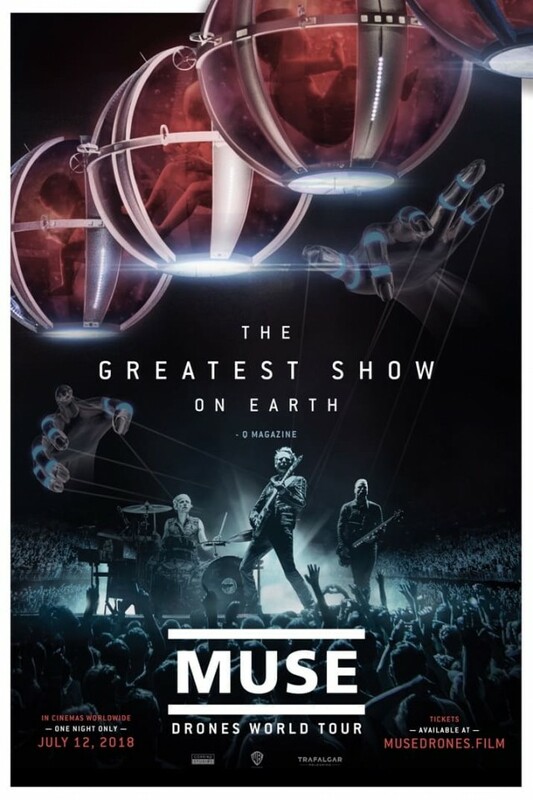 The showtimes of "Muse: Drones World Tour" in Ukraine will be held in theaters "Ukraina", "Kiev", and "Planeta Kino" (Kyiv, Odessa, Lviv, Kharkiv). Information about tickets can be found on KyivMusicFilm event on Facebook. Read also: For the first time on Liberty Island. Review for The Rolling Stones’ film "Havana Moon"